The Holiday Inn Express Hotel & Suites Vineland is a newly renovated hotel, in the heart of the Vineland Millville, NJ business district and adjacent to the Cumberland Mall. The hotel is just minutes away from South Jersey Regional Medical Center, NJ Motorsport Park, Durand Glass, General Mills, and Millville - Wheaton Art district. We are just 20 minutes between Stockton University in May's Landing and Rowan University in Glassboro and just 30 minutes from Philadelphia-Deptford area, Jersey Shore Points and Atlantic City Casinos, off Rt. 55 at exit 27. Our hotel features all new guest rooms with upgraded bedding & furnishings, 42" HDTV's, free hotel wireless high speed Internet access, a business center, a refreshing indoor pool and whirlpool, spacious guest rooms with free local phone calls, a daily Express Start Breakfast Bar - with our exclusive cinnamon rolls, a small meeting room and elevators. Some rooms feature miniature kitchenettes. 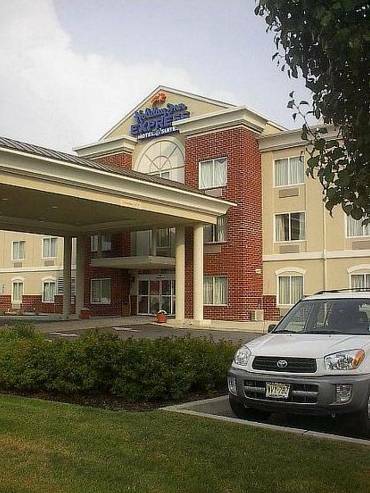 Stay smart at the Holiday Inn Express Hotel and Suites while visiting the Vineland and Millville, NJ area! Our state of the art Cumberland Meeting room features complimentary drop down screens and wireless internet service inclusive. We offer a full services meetings package and food & beverage. The Cumberland Mall is located adjacent to the hotel within walking distance. Stores include: Marshalls, JC Penny, Radio Shack, Burlington Coat Factory, Babies R Us/ Toys R Us, American Eagle, Old Navy and many more! Running Deer was ranked in New Jersey's Top Rated Golf Courses by Golf Digest. The 18 tree-lined holes of running Deer are spread out over 300 acres. The Delsea Drive In was built in 1949, closed in 1987, and reopened in 2004. Located in Vineland, NJ it is the only drive in theater in the entire state!